For a couple of hours this afternoon it felt like spring had arrived early. Striding the high moors under a blazing sun in just a base layer with the sleeves rolled up. Bliss. A couple of hours later it was winter again in the shadows to the north of the hills. The river and reservoir were frozen. 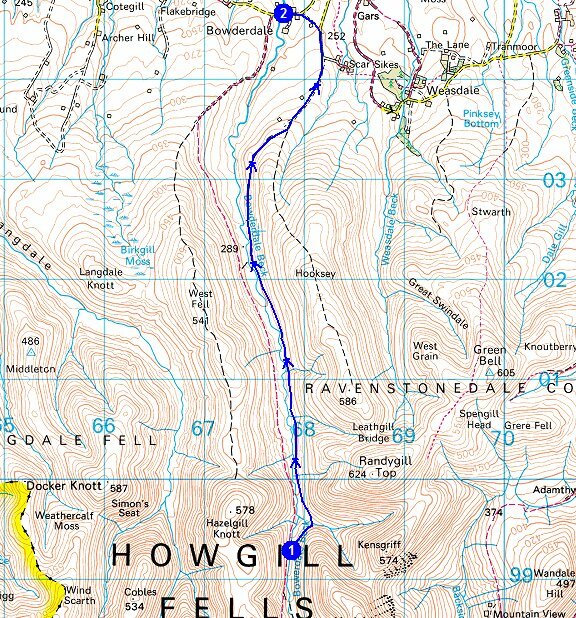 Today was hound mountain training part two, a bigger hill to climb and 11 miles in total. The dog is definitely fitter than me! My new hiking buddy was picked up from the rescue centre and we spent the weekend getting to know each other. 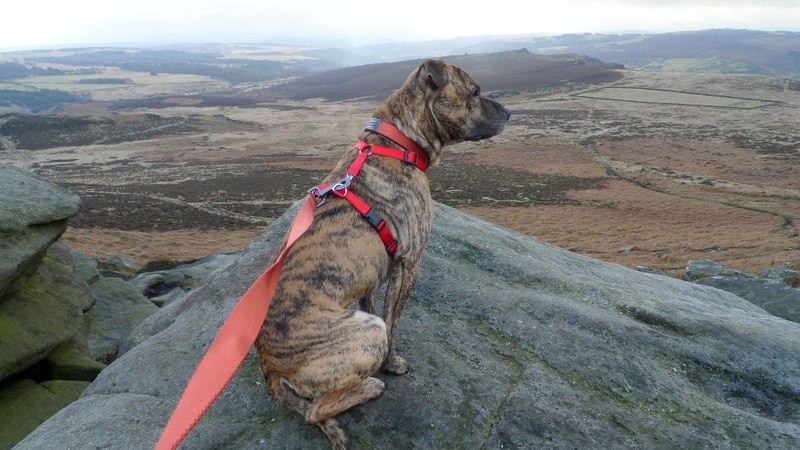 I was keen to see if he had the potential to be a hill hound, so with Monday booked off work the Bongo was pointed in the direction of the Peak District. 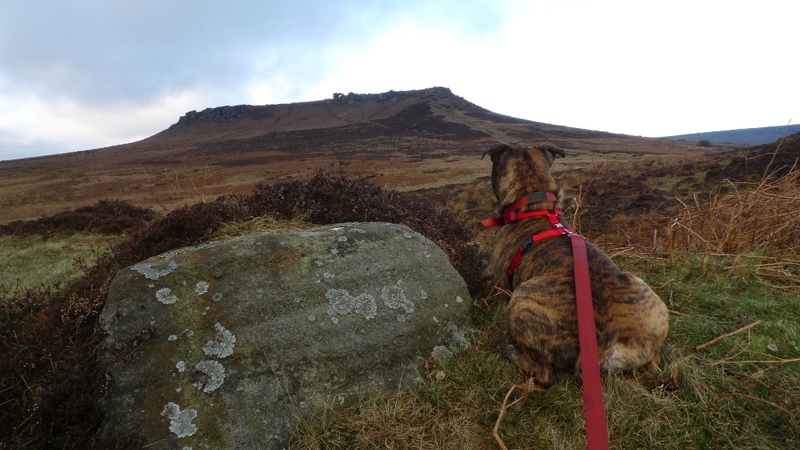 I was keen on a stomp on the high moors, but being unsure if Rueben would enjoy being dragged up a large hill I decided to play it safe. The area around Fox house on the eastern edge of the national park is both easily accessible and pretty spectacular. This is emphasised even more when you pass a road sign which indicates that you are in Sheffield city. Are there any other cities in the UK that have such wild scenery within their boundaries? There are spaces for a few cars on the Grindleford road. However be aware of the police signs along this road pointing out that you will receive a £60 fine and three points on your license if you park illegally! We dropped down to the footbridge across the Burbage brook and headed across the open moor towards the surprise view car park. This is a very apt name as when you drive from Fox house to Hathersage along the A6187 you come to a sharp bend in the road and suddenly the Derwent valley is spread out below you. I have come this way may times and the dramatic scenery always takes me by surprise. It must do for other people as I have often seen the dry stone wall alongside the road with a car sized hole in it! A path leads up to and along Millstone edge, which in my opinion gives some of the best views in the Peaks for the smallest amount of effort. 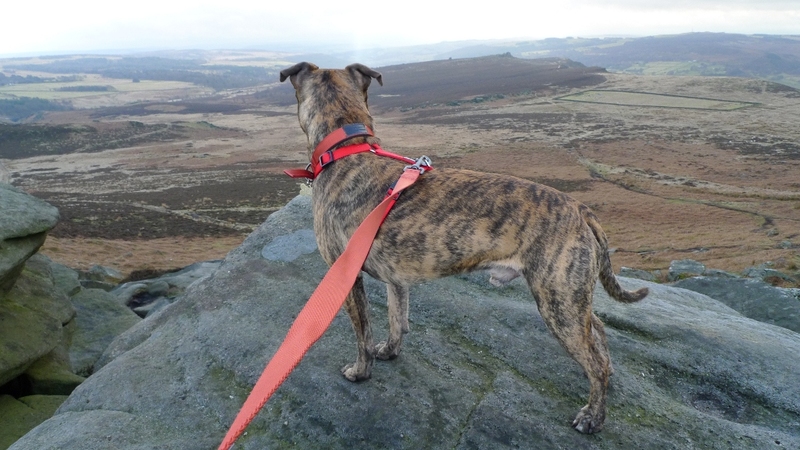 Reuben seemed to think so too as he stopped hoovering the ground with his nose and took time out to stand at the edge with his ears pricked, staring at the northern peaks. Actually it may have been the wind that got his attention! Over Owler tor is insignificant on the map but a great jumble of Gritstone on the ground, perfect for seeking a spot out of the wind for some food. 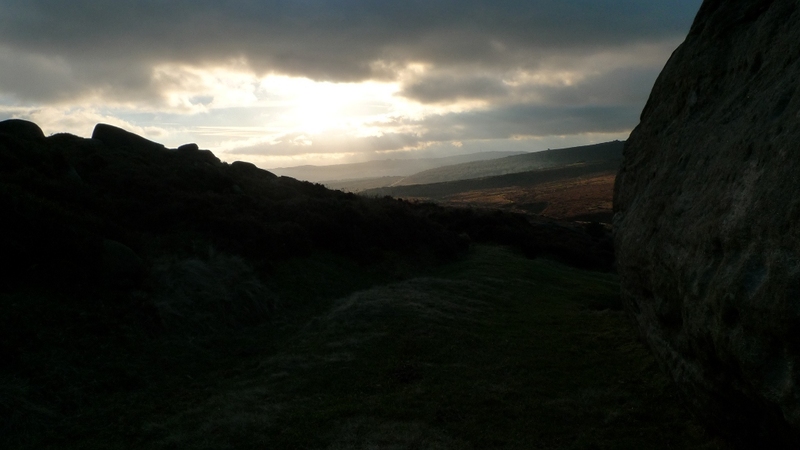 Higger Tor dominates the horizon here. A further easy almost level stroll then brought us to the top of Carl Wark, an Iron age hill fort. 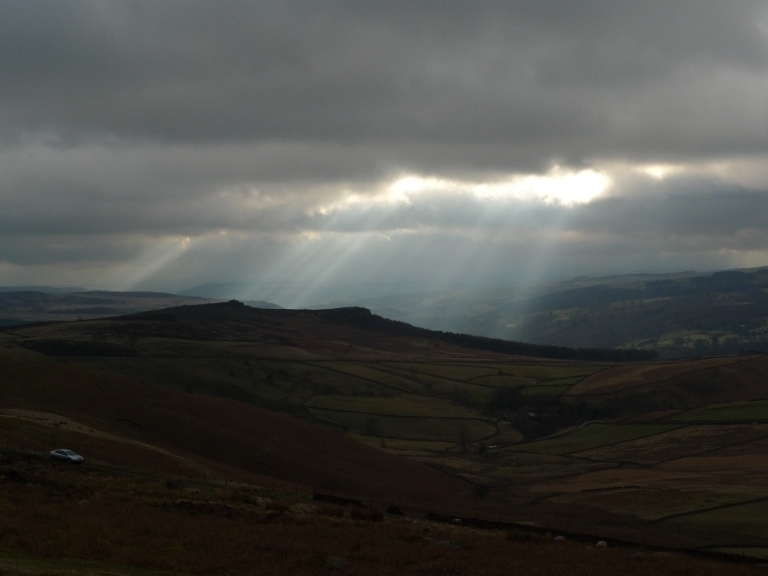 The wide path to the summit of Higger Tor ends with some gentle scrambling to reach its summit. Here I discovered my new-found friends lack of scrambling prowess. In fact I don’t think that I will trust him with route finding again! Knowing no fear he would attempt rocks that were well outside of his grade and I would often get tangled in canine enthusiasm and a six-foot lead. 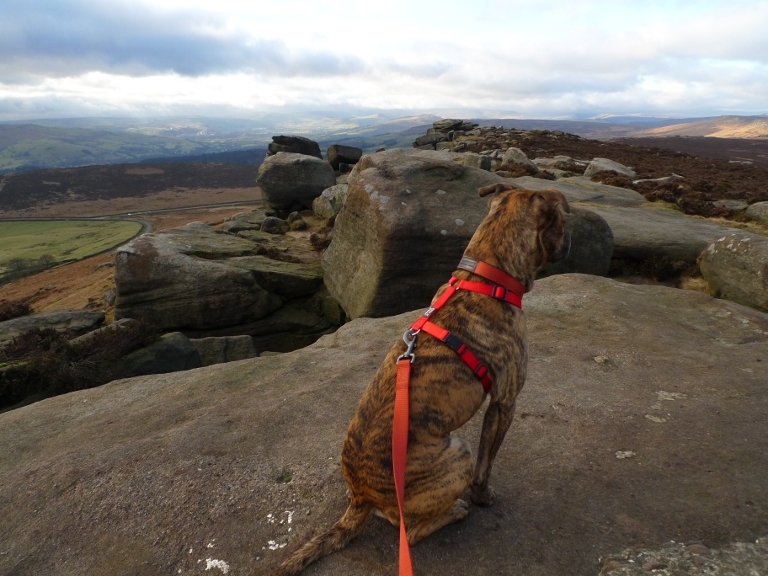 Anyway we made it and got to sit for a while on the Gritstone that rings its edges to contemplate the unfortunately dull and hazy views. I soon came to a obsticle too far for Rueben, a particularly tricky stile if you do not possess arms, legs and problem solving skills. We gave up on that one and attempted an easier one further along the road. I climbed over first and called to him, he just sat there and gave me a look. 20kg of dog is not that easy to manhandle over a four-foot obstacle but we managed it with pride intact. Suddenly the leaden grey skies were torn apart by shafts of sunlight illuminating the way we had come. 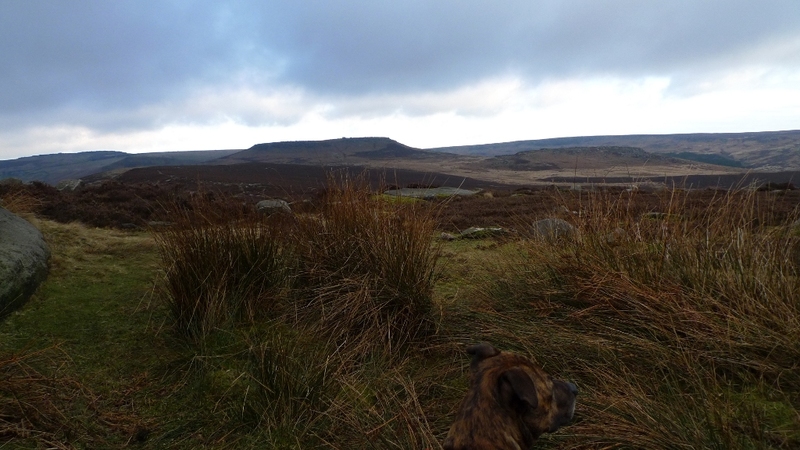 Our visit to Stanage was short, a quick visit to the trig point and back down to the road. I have to say that it was tempting to walk its entire high level promenade but I did not want push my new hill friend on his first outing. I had intended to walk along the top of Burbage edge but a spot of laziness and a nicely graded track beckoned me instead. Typically as the day was turning to late afternoon and I was on the way back to the van, the sun started to win its fight with the clouds. Stopping for coffee behind the shelter of a large boulder the lowering sun began to light up both Carl Wark and Higger Tor. 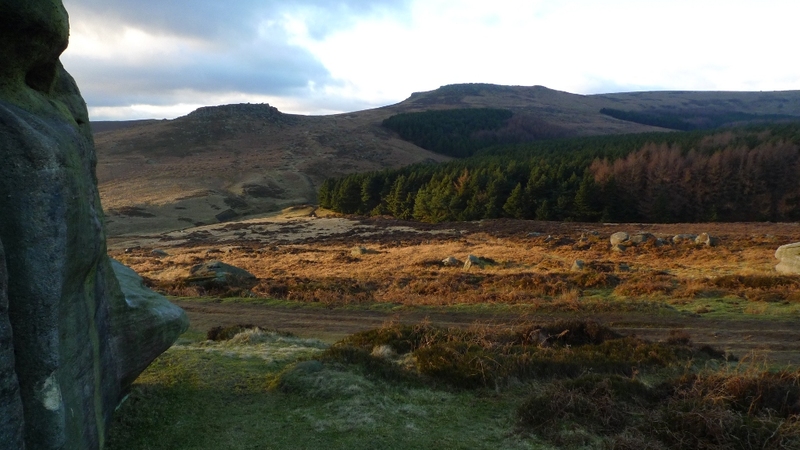 The Burbage valley here is a lovely wild corner on a Monday afternoon in January. 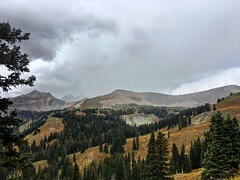 You can pretend to yourself that you are in the middle of a vast wilderness for a few moments. That certainly is not possible at weekends when this area is simply teeming with people from the surrounding cities. Rueben started shivering so we made our way back to the Bongo. 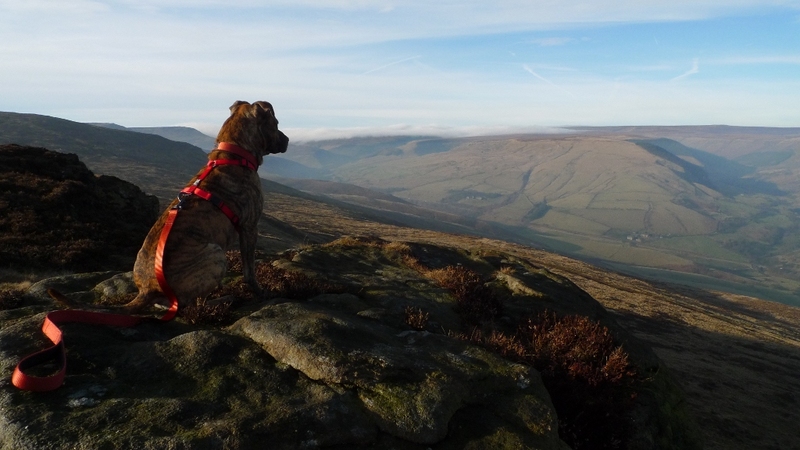 His first hill walk had been a success and it certainly gave the walk a different flavour for me. As soon as he was strapped to the back seat Reuben was asleep, a tired dog is a happy dog. 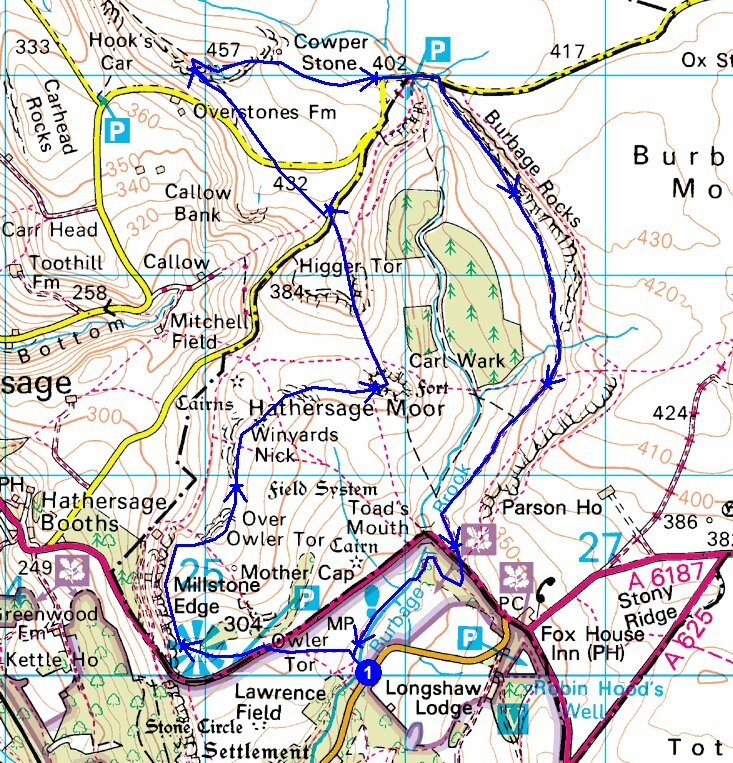 A plan was hatched before Christmas with Martin to get in some training for the TGO challenge. Get some miles and hills under our belts and test the gear that we each planned on taking. The weather forecast the week prior to meeting up was not looking good and there were email discussions of Plan A’s and plan B’s. In the end we decided to just have a plan A and see what the weather threw at us. 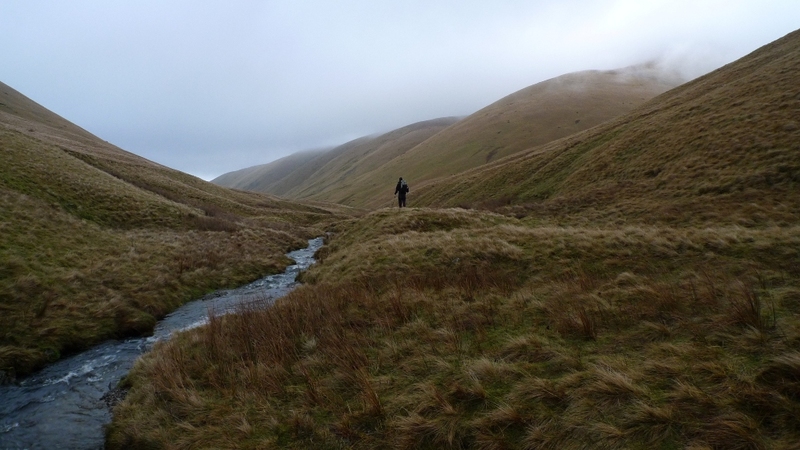 The Howgill fells are easy to walk out of within a couple of hours, if it got too bad we would stay low and head back home. We hoped to meet up with Mike and Bruno on the morning after our wild camp. Mike forecasted that we were doomed………….. It was an early start to get to our rendezvous at the alloted time, the Bongo being rather thirsty if I do any more than a quick trundle up the motorway. I arrived at Bowderdale Foot ten minutes early and Martin had phoned to say he was seeking out a bacon buttie in Tebay. Time for a quick brew and some breakfast in the van. Parked up on a grassy verge I asked a farmer passing on his quad bike if it was ok to leave vehicles here. He did not even bat an eye when I said that we were heading up onto the hills to camp, he just warned me to be aware of gales tomorrow and said a couple headed off with large packs the day before. I feel more confident leaving the Bongo in remote areas after receiving the ok from locals. Martin duly arrived and we kitted up, the weather already was damp, gloomy and a bit on the breezy side. 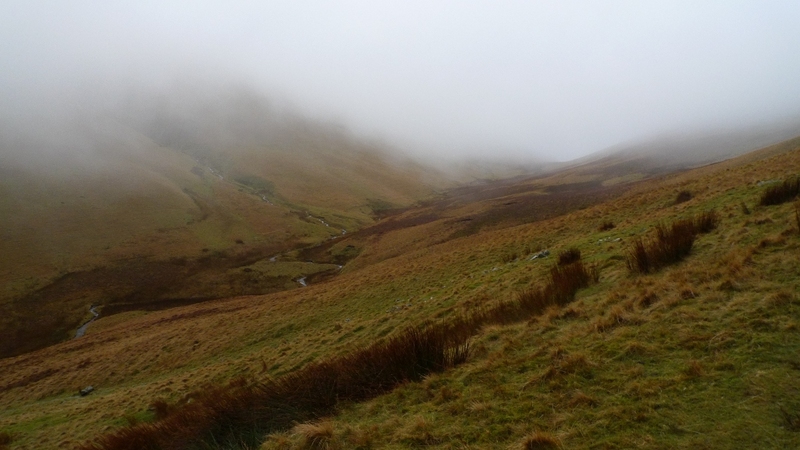 We stepped off the road onto the boggy bridleway into Bowderdale and were almost immediately enveloped in mist. No views backwards, forwards or side to side. 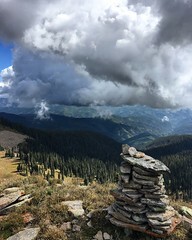 It would remain that way until dropping down to camp later on that afternoon. When the wall ran out we peeled off the bridleway and headed uphill towards West Fell and the long old ridge that would eventually lead to the summit of The Calf. We soon got into a nice steady pace and the conversation flowed easily. The TGO challenge and routes were discussed alongside blogging and the usual kit talk. As we climbed higher the wind got stronger and words would get torn out of our mouths and dispersed onto the surrounding fells. Approaching Hazelgill Knott we were staggering around like drunks, so after contouring its slopes we sought shelter in the lee of the hill for a quick snack and chat. 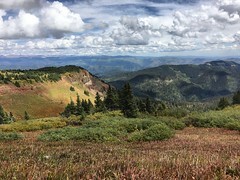 We both cooled down quicker than anticipated so we continued on up the ridge trying to imagine what the views would be like. 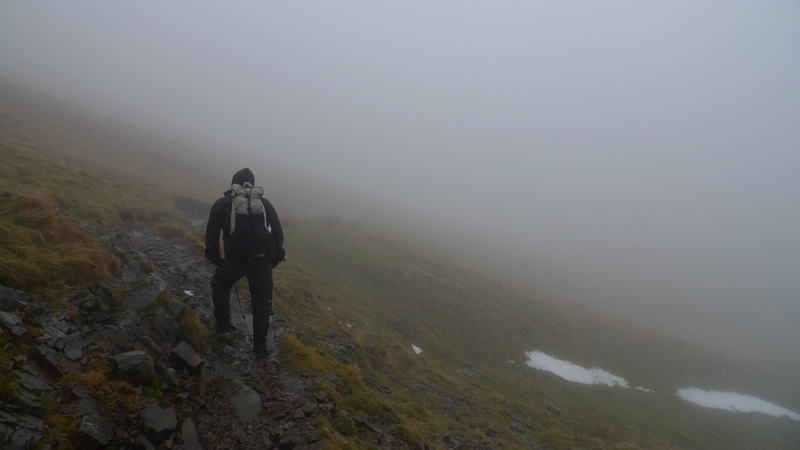 Long grassy slopes are not the most fascinating places to be in poor visibility and a few checks of the compass ensured we were on track. It was a case of heads down and plod on. Suddenly a strange apparition loomed out of the mist. To me it looked like an elephant standing head on to us, my heart did a little skip and then the elephant divided into two. It turned out to be a couple with huge packs bent over a map! Quick greetings and we turned onto the main Calf track and found the trig point, luckily just where we expected to find it. Martin phoned Mike to confirm that the weather was indeed rubbish and arranged that we would meet him at 9.00am if the weather was not too bad the following morning. At that point we were still being wildly optimistic! The aim then was to find somewhere to camp within striking distance of Bowderdale head, close enough to meet Mike in the morning but with as much shelter as possible. 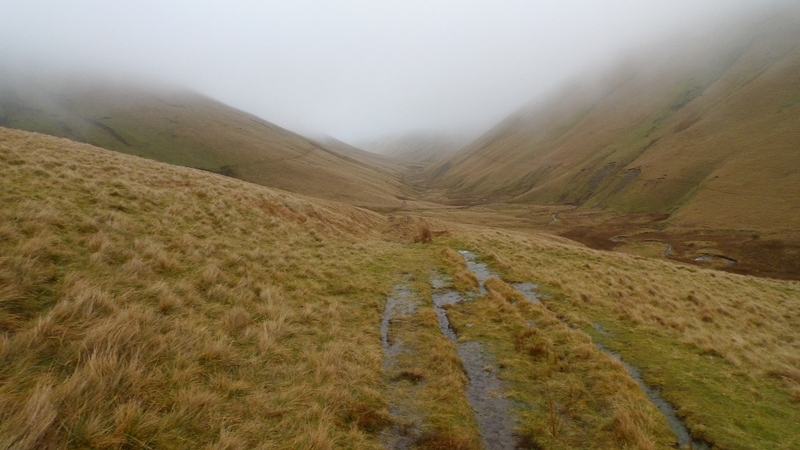 The bridleway down to Bowderdale head was easy to follow in the mist and we could sense the steep slopes to our right, eventually plunging down to Cautley Spout. Readers of Martins blog will instantly recognise the profile above from the self timed photos he posts, indeed this is how I recognised him profiled against the sky when I bumped into him in the Lakes. I have to say that I tried my best to get a photo of his face but his mystical powers ensured that they all came out blurry. I can assure readers that he does have a face! Just below the mist the higher reaches of Bowderdale felt like a wild spot, we almost could have been in a remote Scottish glen. It was time to find a place to camp, hopefully sheltered as even here down in the valley the wind was gusty. A few pitches were identified but the gusts were too strong. We continued on down the valley to the nicely named Randy Gill where the air was as still as it could be. Unfortunately there were no ideal spots big enough to accommodate two tents. Crossing and recrossing the river we eventually settled on a spot on a shelf above the river. There was a good strong wind blowing but it would have to do, darkness falls early and quickly in January. Tents that are good in the wind still have to be put up in the wind and until poles are threaded and pegs positioned it is just a flapping bit of nylon. 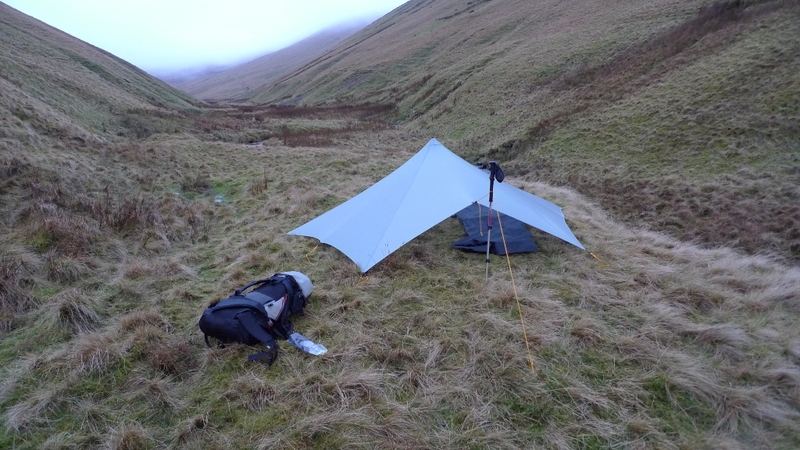 Martin was testing his trailstar shelter for the first time in the hills and I have to say that it was amazingly stable, an equal to the Scarp1 with its three poles. Some time was spent chatting under Martins shelter but before long I was feeling chilly so retired to my tent to change into dry clothes and get some hot food into my stomach. There was a brief respite for a couple of hours when the wind stopped gusting and the sky cleared with a bright moon shining. A false sense of security…………………….. The wind built during the night, getting stronger and stronger, then around midnight the rain joined in the assault on our camp site. 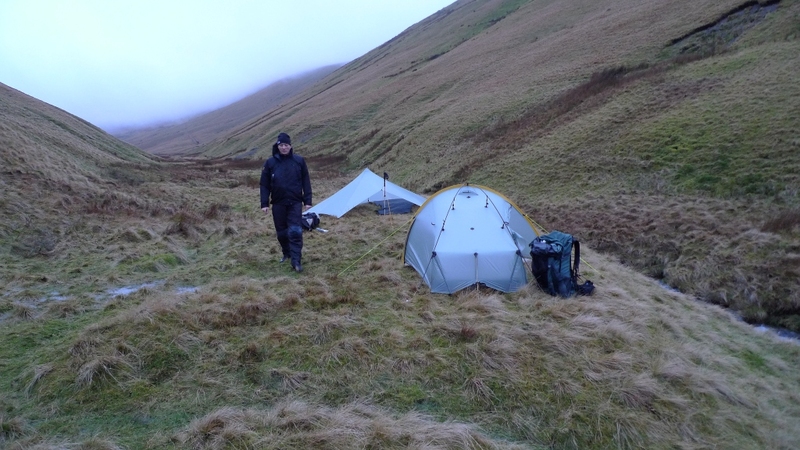 Steady strong winds buffeted my tent all night with stronger gusts tearing down the valley at random intervals. These sounded like trains roaring towards us, getting louder and louder until the full force hit the tent. The rigid structure did not flap but shook as a whole, the air pressure changing inside with each gust. The rain came down all night in bucket loads and I drifted in and out of sleep waiting for the fateful moment when a pole would snap. 7.30am my alarm went off and it was still dark, I popped my head out of the door into a violent grey world before retreating back into the dry sanctuary. A coffee and some noodles before I was greeted by Martin, it was immediately agreed that we would bail out. It was not a day to be on the hills, or even in the hills. This is what my world looked and sounded like at 8.00am that stormy morning. Tents packed safely away we examined the river which was now a foaming torrent and impossible to cross, anyone falling in it would be swept off their feet and carried rapidly downstream. Instead we found a sheep track that contoured around the hillside. Descending back down I had a nasty slip, my leg twisting at an angle behind me. A jolt of pain but luckily I was able to get up and continue walking, it was not a day for being carried out. Randy Gill was now in full spate, even though its source was less than a kilometre away the speed and volume of the water was astonishing. The depth and speed would have meant being knocked off your feet if attempting a wade, a jump was the only way. Martin had the height advantage and crossed with ease, I faltered and found it difficult to sum up the courage. In the end I took off my pack and threw across to Martin before doing a running jump. My heart was in my mouth for a few minutes afterwards. 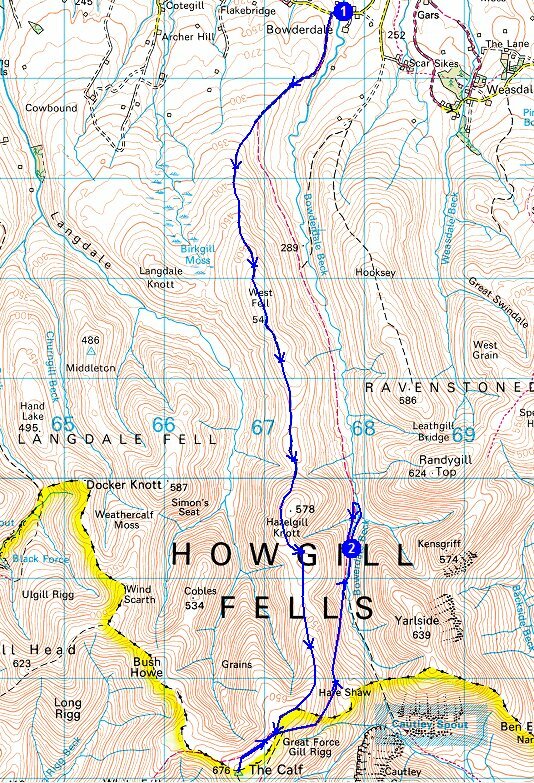 The steep hillsides were literally streaming with water, large streams appearing that were not marked on the map. It was slow going with any flat bit of ground being totally waterlogged. A group of fell ponies added beauty to the bleak scene. Bowderdale Beck lower down had burst its banks, a huge dirty brown swirling mass of water. We began to worry that our vehicles parked next to it down stream would get washed away. The track that would lead us back to our vehicles was finally reached and we began to climb out of the valley just as further gusts tore at us, we had to brace ourselves and let them pass. Luckily at the road head we could see our vehicles sitting happily where they had been left, although next to a river that was swollen and angry. It was almost exactly 24 hours since we had left them, 24 hours of wind, rain and mist. I would have much prefered sun and frost but it was great to experience weather like that and emerge unscathed. Is there still a place for the humble fleece amongst all of the new hi-tec fabrics and garments that are available to liberate money from our wallets? When Webtogs asked me to review a North Face fleece I secretly turned my nose up, even before I knew what I would be getting! I asked if I could have the lightest fleece garment that they had in stock, this hopefully would make it suitable for backpacking. Now let’s get one thing straight before I look at this fleece in more detail. It has been in my possession for nearly a month now and it has been worn every single day since I got it! It’s been worn on the hill, walking the dog in the woods, in the office and for lounging around the house. Unfortunately I am pretty fussy in what I choose to wear, comfort being the major consideration. It is the comfort factor that has sold it to me, but with the exception of its comfort, is it any good? 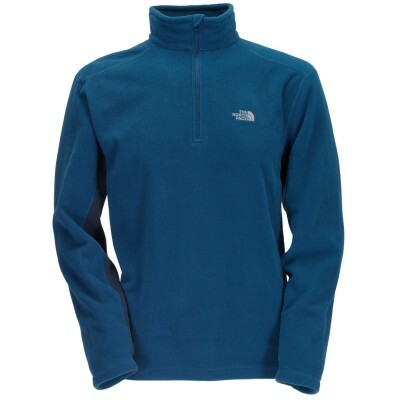 It is made from Polartec Classic Micro fleece which is light and very soft to the touch. I would describe the cut as ‘relaxed’ a good fit without feeling restrictive. It has got a deep quarter length zip for good ventilation which also makes it easier to put on and take off. I have always had a preference for outdoor garments without full length zips as they can sometimes feel bulky under a backpacking sacks hip belt. There are no pockets which is good as they would only provide bulk in my opinion. The fabric itself only stretches one way which does mean that the sleeves and the back rides up a bit when reaching upwards. The non stretchy flat seams also contribute to this. The hem and the sleeve cuffs are not elasticated which adds to its general comfort but is not ideal on a cold and windy fell when you want to cinch everything in. One drawback of microfleece is that it is definitely not windproof. 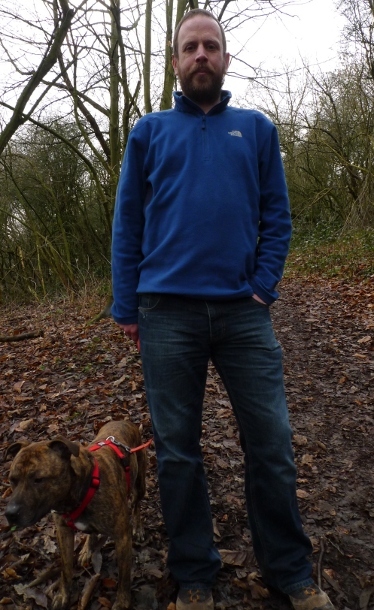 However I always carry a lightweight Rab windproof jacket with me, so that’s no problem as part of a layering system. I popped it on my scales and it came in at 250 grammes which is fairly lightweight. I think that it is a bit of kit that I will be taking on the TGO challenge. 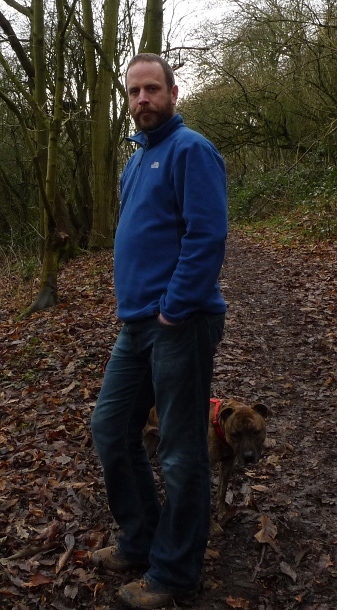 I was going to take my Paramo jacket which I only find comfortable in cold conditions. Because the weather in May could range from warm and sunny (hopefully) to wet, windy and possibly snowy I think that I am going to go for a lightweight layering system. A merino wool base layer underneath this fleece and a windproof on top would be ideal for most conditions at that time of year. A rare clothing hit with me. It can be purchased directly from Webtogs here.